Rendering of the interior of the Museum. Image Credit: LPC. Approved addition, occupying a quarter acre of parkland, will increase connections for better museum circulation, provide additional space to store collection materials, and allow visitors to watch scientists at work. 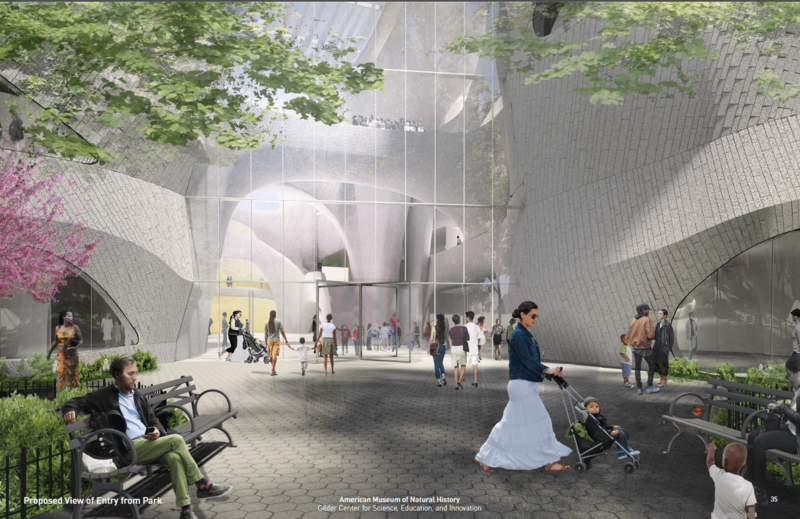 At its meeting on October 11, 2016, the Landmarks Preservation Commission voted to issue a binding report for the construction of an addition, and associated demolition, to the American Museum of Natural History, an individual landmark on Manhattan’s Upper West Side. The addition, to be named the Gilder Center for Science, Education and Innovation, will be the first significant intervention on the museum campus since the completion of the Rose Center for Earth and Space in 2000. The addition would be sited on the western side of the museum, and would create new Columbus Avenue public entrance. Michael Novacek, Museum Vice President and Provost, said the Center would raise awareness of the Museum’s function as an active scientific research institution, and allow it to expand and improve its ability to carry out its scientific mission. Novacek said the Center would accommodate improved spaces for artifacts and specimens, spaces for scientists and their students, and reveal the scientific work to the public. He said the museum’s collection is tremendously important to scientists and their increased proximity would facilitate scientific discovery. Higgins Quasebrath and Partners’ Bill Higgins attested that the demolition necessary for the construction of the center would be “demolition with a small ‘d,’” constituting the loss of a heavily altered powerhouse and its 1965 addition, and the 2000 Weston Pavilion. The New York Times Capsule, designed by Santiago Calatrava, would be relocated to a different part of the campus to make way for the Center. Higgins testified that the new center would be set as deep as possible within the existing institution, so as not impose on park space. Higgins also discussed the Museum’s master plan and evolution of the museum and its campus. He testified that the original master plan and its system of corridors, never came to fruition, and the museum is “full of dead ends and confusing places.” Originally conceived as Victorian Gothic, the Museum later grew to encompass Romanesque Revival and Beaux Arts styles. Higgins said the museum had a history of curvilinear forms playing off its rectilinear form. 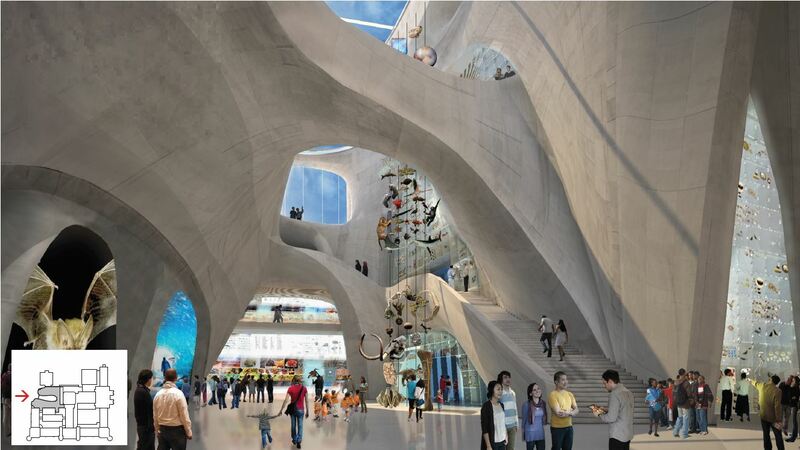 Architect Jeanne Gang, of Studio Gang, presented the design for the addition, inspired by geological forces like water and wind, and the natural forms they create, like slot canyons and ice caves. The addition would be composed of structural concrete, with the shape determined by the necessities of gravity, while the floor plates would mimic the curvilinear forms found in nature. Gang said the “layering and stratification” of the faced would relate both the architecture of the existing structures, as well as the museum’s function as a repository of natural artifacts and knowledge of natural history. The work would include the creation 30 new connections to facilitate movement in the museum. Rendering of the exterior of the Museum. Image Credit: LPC. On the outside, the curved surface of the concrete would be covered with diagonal tiles of Milford pink granite, the same material used on the museum’s Theodore Roosevelt memorial, which is still quarried in Massachusetts. The granite tiles would be arranged in staggered pattern. For the concrete, the designers created an aggregate that would recall natural stone, particularly flecked granite. The concrete would be bare on the interior of the addition, but the composition was intended to flow smoothly between the interior and exterior. The addition would occupy about one quarter-acre of current park land, and entail the loss of seven existing trees. The facade will be partially screened by tress, and continue to be perceived as “a museum in the park” Gang stated that the plan had been modified to protect certain trees, including an old elm. Landscape architect Joseph James, of Reed Hilderbrand, described associated work in the park to be done in concert with the construction of the addition. Pathways would be built for limited-mobility access to the entrance, emphasizing the curvilinear forms raised by Higgins. The “wider, more welcoming” entrance to the park from the sidewalk would be created on Columbus Avenue. More trees and beds of plants would also be established in the park. Manhattan Borough President Gale Brewer spoke in support of the plan, calling it a “significant step in advancing the museum’s commitment to integrate scientific achievement and public education.” A representative of Council Member Helen Rosenthal similarly endorsed the proposal, and said the design was appropriate to the museum and the historic district. A representative of Community Board 7 also endorsed the project, and stated that what community opposition was voiced focused on the diminution of the park, and suggested that the museum create public space on the roof to compensate. Christabel Gough, speaking for the Society for the Architecture of the City, called the proposal intrusive, and said the facade design was “unresolved on its own terms.” Gough further recommended that the museum extend its educational outreach to satellite throughout the City, rather than concentrating student space on the Upper West Side. Landmark West’s Kate Wood said the park was a public asset worthy of preservation, and the museum did not possess an “unrestricted right” to develop in the campus. The Municipal Art Society’s Thomas Devaney supported the museum’s expansion needs, and said the proposed facade was an improvement over the existing gap in the Museum’s face. He said, however, the design could be improved, and was unresolved in its proportions, materials and in its solid-to-void ratio. One speaker alleged that the Museum could not reduce the amount of parkland without the approval of the State Legislature. Venable attorney Gordon Davis, counsel to the museum, said the museum and park were established by State legislation in 1876, which granted the Museum the right to expand in the space without seeking additional approvals by the Legislature. The right had been challenged in a suit contesting the establishment of the Rose Center, and the Museum’s ability to develop the property was upheld by the courts. Commissioner Diana Chapin opined that the site selected was the most appropriate area for an intrusion, and the addition was well integrated into the historic buildings and the landscape. Commissioner Michael Devonshire praised the proposal’s “sensuous sinuous natural quality,” while Commissioner Wellington Chen found it “soaring” and “inspiring.” Commissioner Fred Bland said the museum had been built up since its inception by “excellent architecture of its time along the way.” Bland also thought the proposed landscaping would improve on the park’s current state. Commissioner Adi Shamir-Baron singled out the planned entry to park on Columbus Avenue for praise. LPC: The American Museum of Natural History, 200 Central Park West, Manhattan (18-2569) (Oct. 11, 2016) (Architects: Studio Gang). THIS from our Landmarks Preservation? If this is the best you can do, delete me from your website. I’ve lost all confidence in your organization. you’ll see what a drastic mistake has occurred.